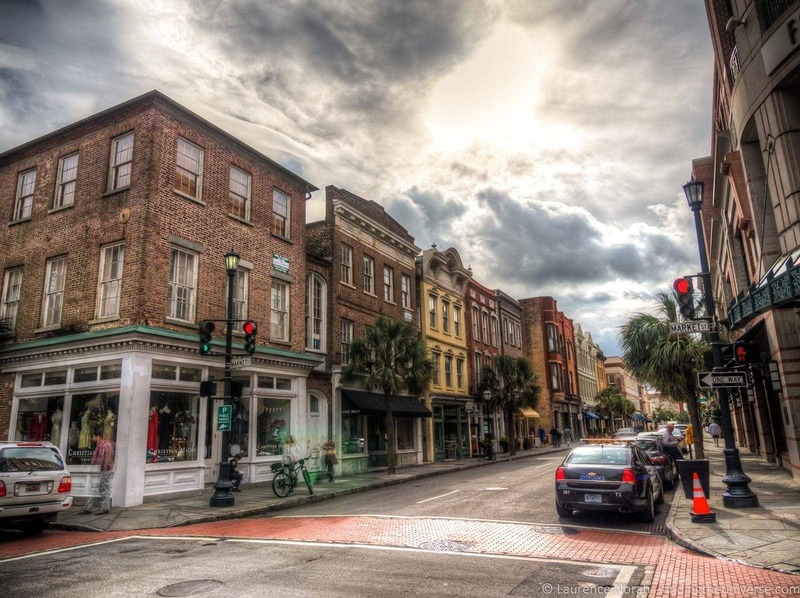 Charleston, South Carolina, is the perfect city for a short getaway. 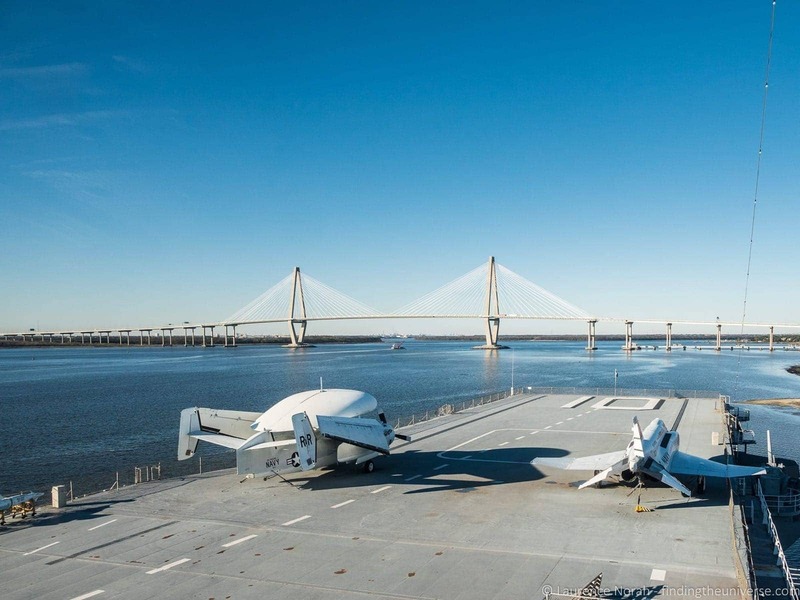 We think that 2 days in Charleston would give you enough time to see the majority of the highlights, sample some of the incredible food on offer and even take in some of the surrounding attractions. With this in mind, we’ve put together this guide to things to do in Charleston over 2 days. This itinerary highlights some of the many options you have should you visit Charleston for two days, for example over a weekend. 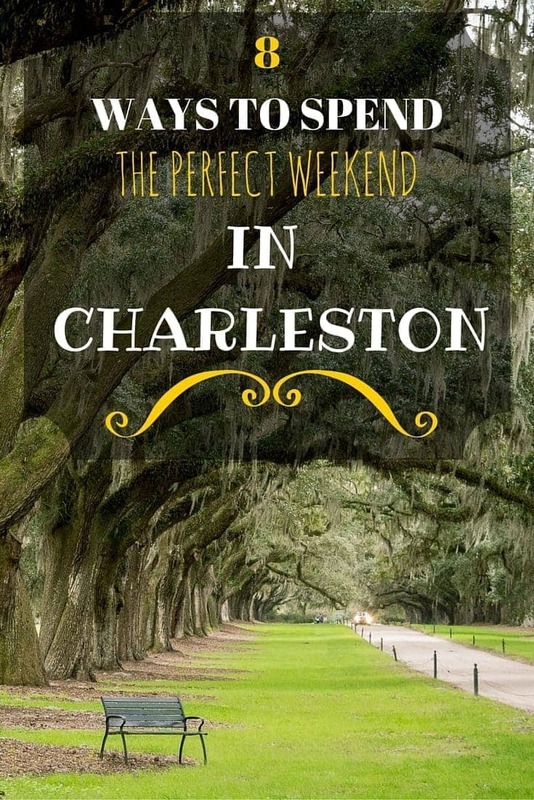 This guide to things to do in Charleston over a weekend could be expanded of course to cover more days should you wish! Our visit to Charleston was the beginning of a deep south road trip across the USA lasting five weeks, and you can see more posts from that trip here. Read on to see some of our favourite locations and activities in Charleston, followed by some tips and advice for your trip to Charleston! 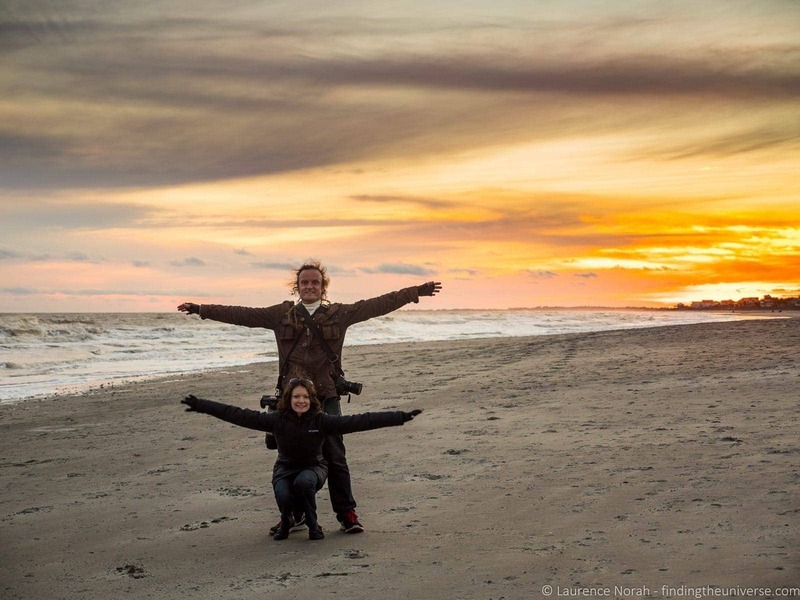 This guide to things to do in Charleston is ordered so you could follow it across a weekend of activities, but of course you can also pick and choose to fit however long you have, any your specific interests. We’re going to start off your two day Charleston itinerary learning a bit about the history of this beautiful city, starting with a visit to the Charleston Museum. Opened in 1773, this is recognised as the oldest museum in the US. A fact which makes it worth visiting by itself, but you’ll find plenty to do to keep you occupied as well. There’s loads of information on the history of Charleston, the American Civil War, and a fascinating exhibit featuring some of the museums earliest pieces. 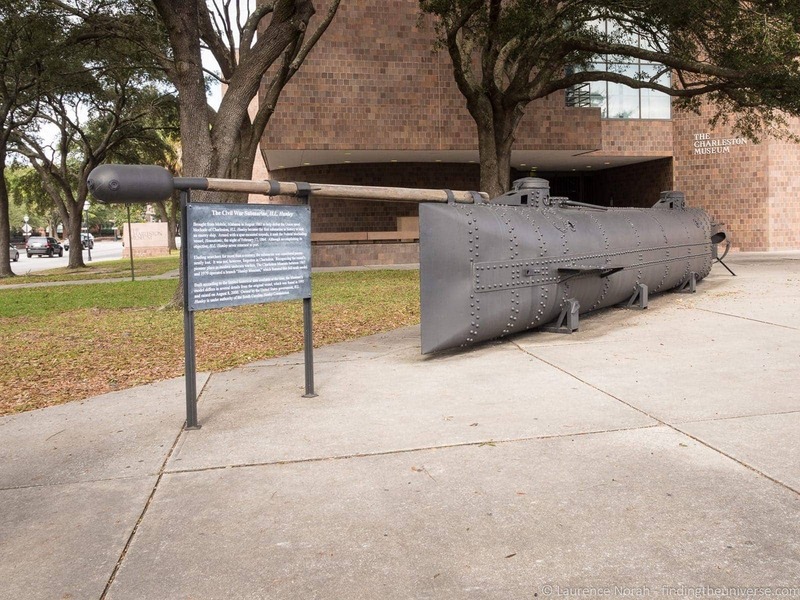 Just outside the front door of the museum, you’ll find a full size replica of the first submarine in history to sink an enemy vessel – the hand powered H. L. Hunley. Note that the Charleston Museum is included on the Charleston Tour Pass, as are a number of other attractions, tours and activities in the city. If you plan on visiting a number of attractions or taking any tours, this can be a great way to save some money. See what’s included and buy yours here (also available on Viator here). 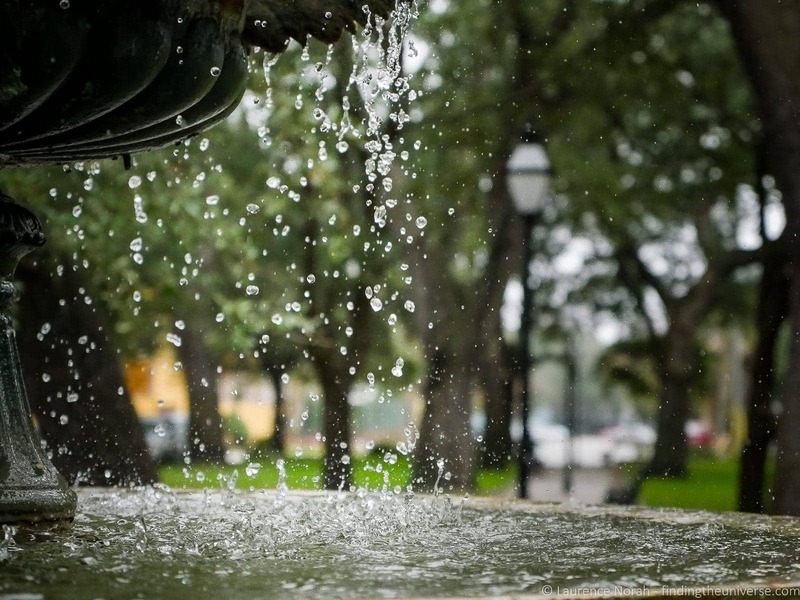 As well as the excellent Charleston museum, Charleston is home to a wealth of grand old homes that you can tour (although unfortunately not photograph inside, hence another photo of a fountain in a Charleston Park!). We toured a number of these houses, including the Aiken Rhett house, and the Joseph Manigault House, both of which were fascinating to tour, offering a glimpse of how the wealthy of Charleston may have lived when in town. If you’re interested in this side of Charleston’s history, taking a tour of one of these historic homes is well worth it. Next up, we think you should take a bit of time to enjoy the beautiful downtown area. 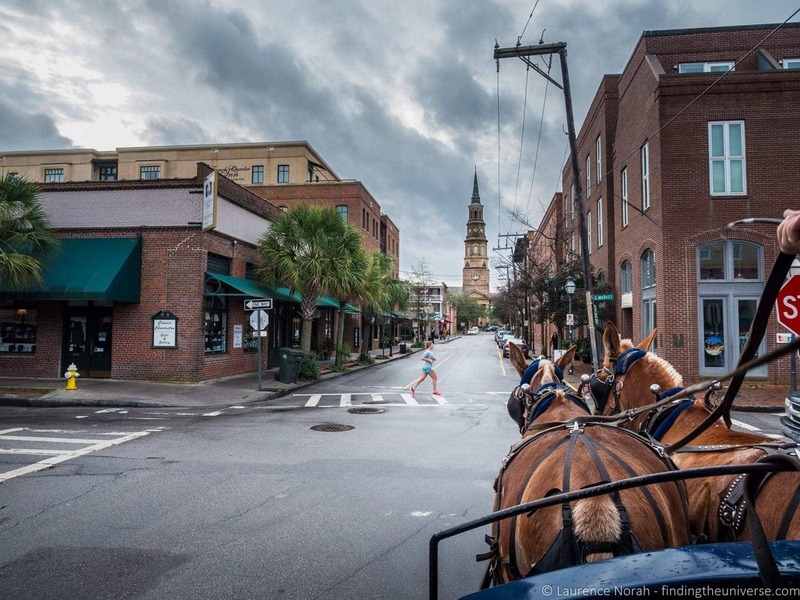 One lovely feature of Charleston is that you can take a horse drawn buggy ride through the city to learn a bit about the history and see the sights. We took a tour with the Palmetto Carriage Works, one of a number of companies which offer carriage tours of Charleston. These tours are also included on the Charleston Tour Pass. Our tour lasted around ninety minutes, and our driver and guide kept us entertained and informed throughout, despite the chilly weather. Taking a carriage ride was a really good way to get a feel for the layout of the city, and gave us lots of ideas for where we wanted to wander with my camera for the rest of the stay. We also got restaurant recommendations and lots of laughs from our guide, so I can definitely recommend this as something to do early on in your visit. 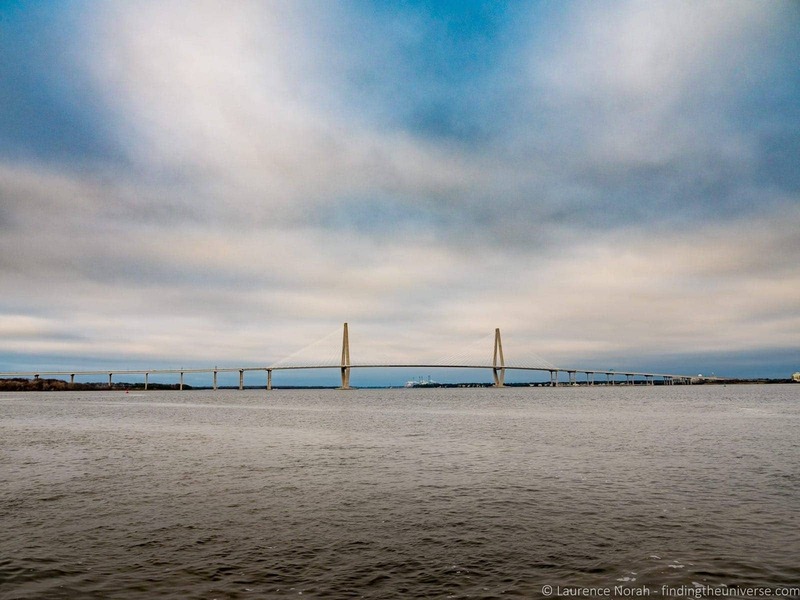 Charleston is known as the place where the first shots of the American Civil War were fired, and the actual location of that first battle was Fort Sumter, situated on an island in Charleston Harbor. Captured by Confederate forces after a 34 hour battle, its strategic importance meant that it would continue to see battle throughout the rest of the war. 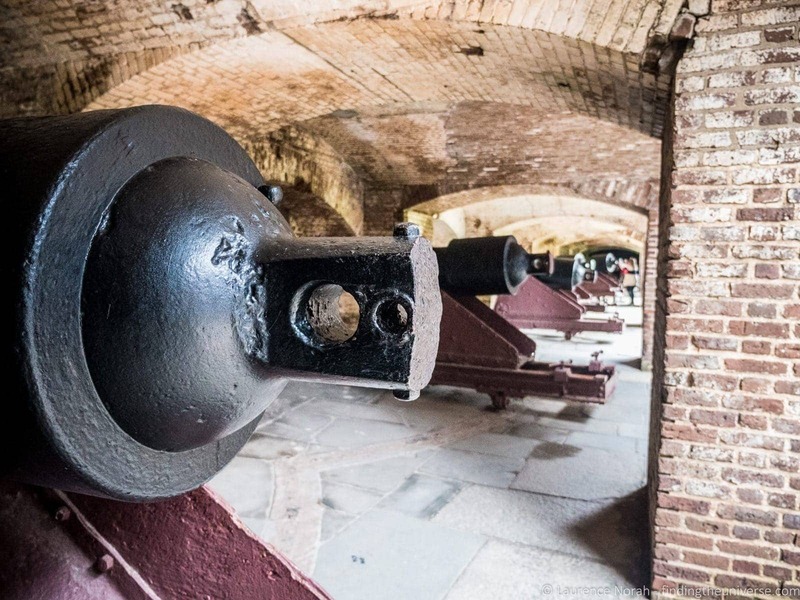 Now operated by the US National Park Service, Fort Sumter is a pleasant trip from Charleston by boat, giving you time to appreciate a view of Charleston from the water, followed by around an hour and a half on the island itself. This is plenty of time to take a look at the cannons, explore the small museum, and try to get a feel for what it must have been like to be around here during the time of the war. Not terribly wonderful, I suspect! It’s probably about time we found somewhere to watch a sunset, right? If you don’t want to leave town, then a good option is down on Battery Point, where you can watch the sun set across the river. 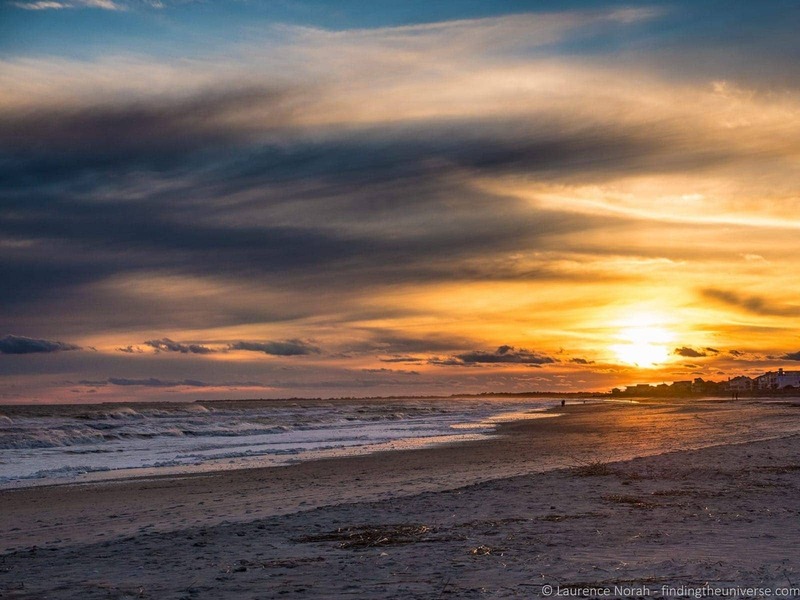 If you don’t mind a quick trip out of town though, then head to Folly Beach. The pier here is magnificent at sunset, and the beach is wonderful to wander along. Once you’re done, there’s no shortage of places to grab a bite to eat – seafood is the obvious choice I’d suggest! If you are following this guide in order as a suggested weekend itinerary in Charleston, this would be the end of our activities for day 2. Time for a nice drink, before moving onto day 2! 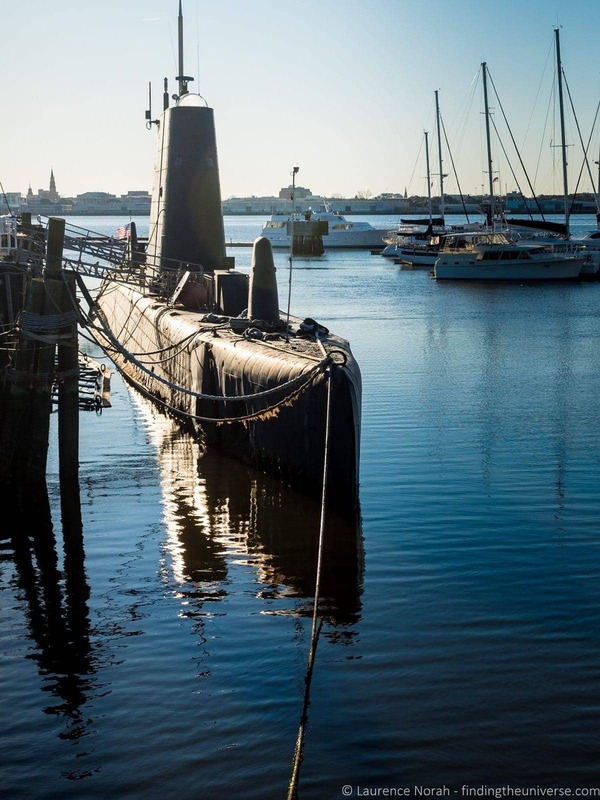 For the second day of our two day Charleston itinerary, we’re going to go sight-seeing at some of the sights a little way out of time, starting with a definite favourite for both of us – the Patriot’s Point Naval and Maritime Museum. This location is home to an aircraft carrier, a submarine, an excellent Vietnam war exhibit and a destroyer, all of which you can explore. You can also take scenic helicopter rides from the museum, for a whole different vantage point of the museum and surrounding areas. Whilst we didn’t take a helicopter ride, we did take advantage of the one flying by to nab the above shot! The USS Clamagore submarine, built towards the end of World War 2. She never actually saw action in that war, but remained in active service during the Cold War before being decommissioned in 1975. Incredible to wander around, unless you’re claustrophobic! 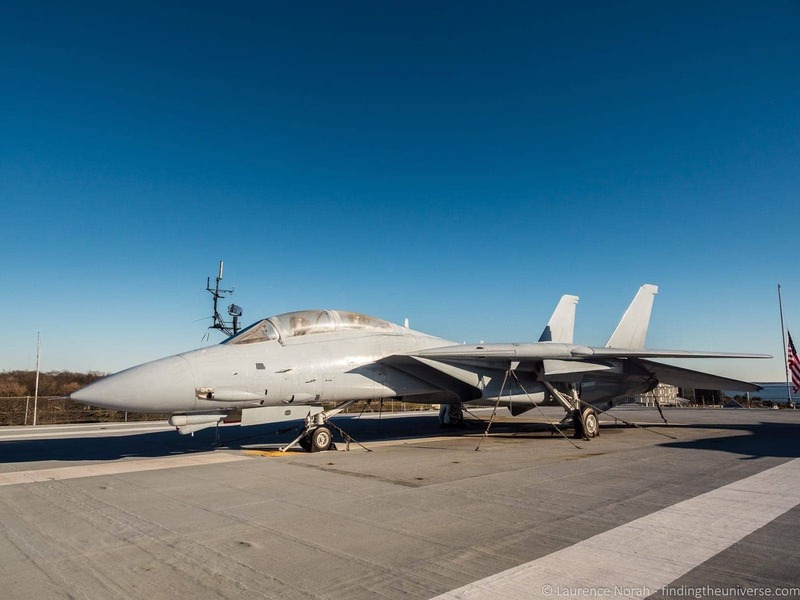 Yes, I did have a bit of a moment next to this F-14 Tomcat, sitting on the deck of the USS Yorktown which brought back all those memories of Tom Cruise flying around in that definitive 80’s movie! Exploring the USS Yorktown was a fascinating experience. Above is the view from the bridge showing just two of the aircraft that are part of an extensive collection here – if you’re into military history, aviation or the sea, you are going to find something to excite you here. We spent a few hours here, but could have easily spent the whole day exploring everything on offer. A definite must if you’re in town. The wealth of early Charleston was generated from the land surrounding it, usually by wealthy white plantation owners, and the hard work of the slaves they owned. To find out more about the latter, I very much recommend taking time to visit the Old Slave Mart Museum in downtown Charleston. To learn more about the plantations, you should head out and visit one of the plantations just outside Charleston. There are a number of these – we visited Magnolia Plantation, Boone Hall Plantation, Middleton Place Plantation and Drayton Hall. These are all different, and if you are interested in gorgeous houses, stunning gardens, and the history of the south, then you should definitely visit at least one of them. Three of them are conveniently close to each other, about a twenty minute drive east from Charleston, whilst Boone Hall is about twenty minutes north-west. Some of the plantations are included on the Charleston Tour Pass. 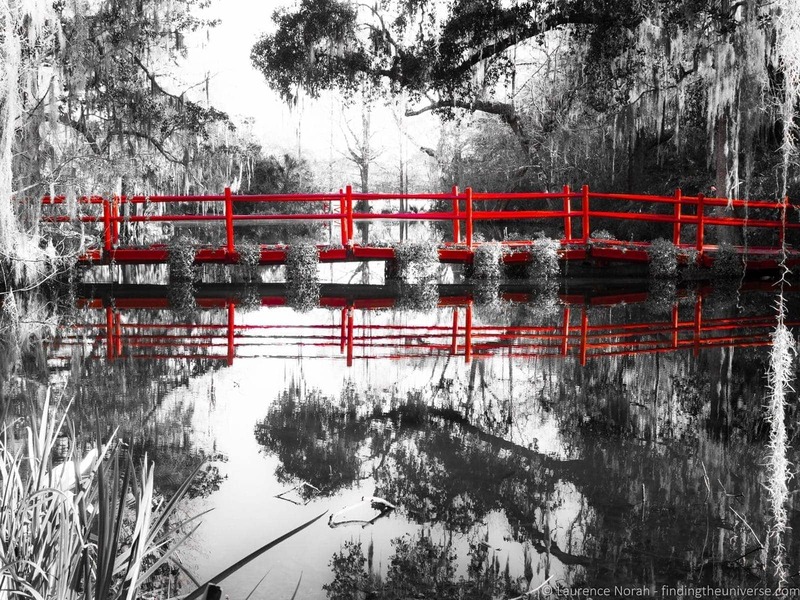 Magnolia plantation, which is featured in the above four images, is particularly well known for its stunning bridge covered lakes and gorgeous gardens. It’s the most visited of all the four plantations, and there is lots to do here, from wandering those gardens, to visiting the petting zoo, to touring the house itself. There’s even a maze to get lost in! 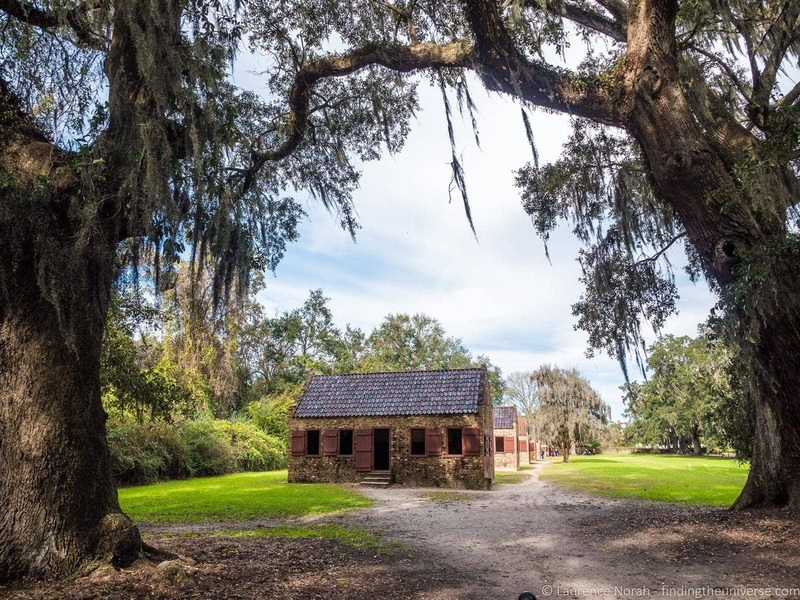 If you’re heading to Patriot’s Point, you could make a day of it and head out to Boone Hall Plantation, which is a little further along in the same direction. 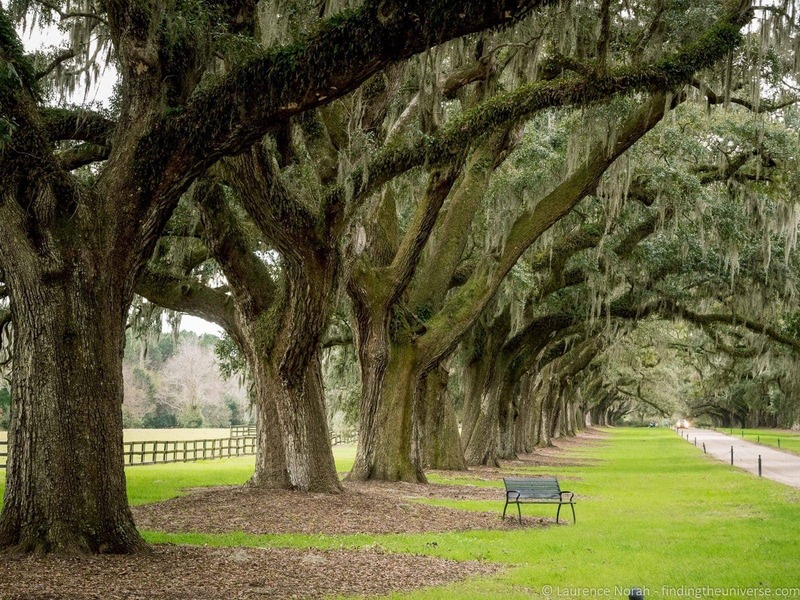 This plantation has a spectacular avenue of oaks leading up to the main house, as well as an excellent exhibition on the slaves who lived and worked here – which is presented in the houses that the slaves themselves used to live in, the so called “slave alley” of the plantation. The final two plantations are Drayton Hall and Middleton Place. 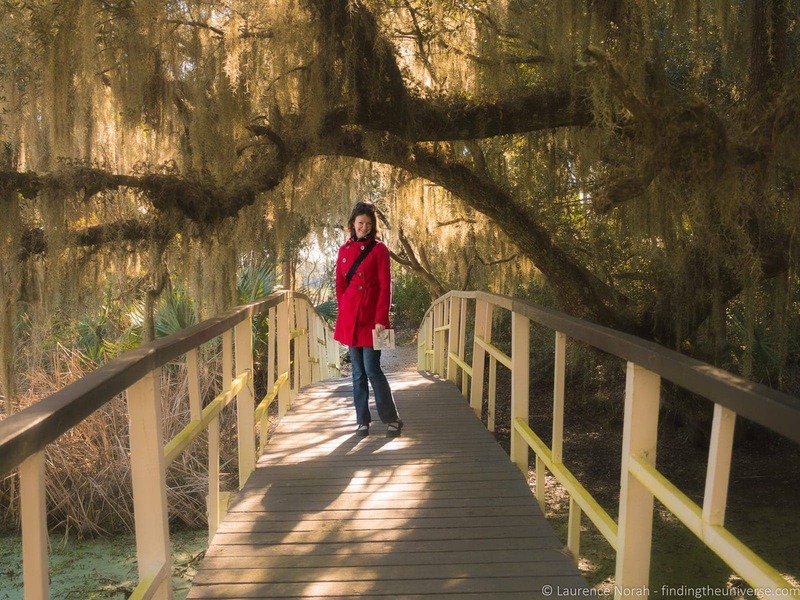 Middleton Place is known as having the oldest landscaped gardens in the US, so if you like landscaped gardens, this would be the place for you. Drayton Hall is unique in that it’s the only property that still has the original house on the property, and it’s also not been restored – rather, it’s being preserved. This means that the rooms are empty, and it has a very different feel compared to the formal grandeur of the other properties. 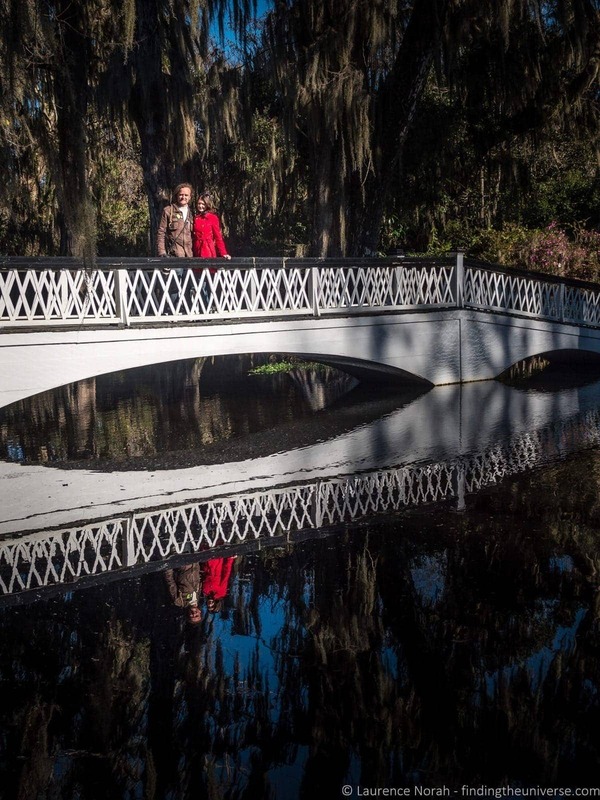 Personally, my two favourites were Magnolia Plantation and Boone Hall – the tour through these properties was excellent, and there was lots to see and do in the grounds and gardens. I also very much enjoyed the old feel of vintage Drayton Hall. However, even if you only visit one out of these four I don’t think you’ll be disappointed by your choice! 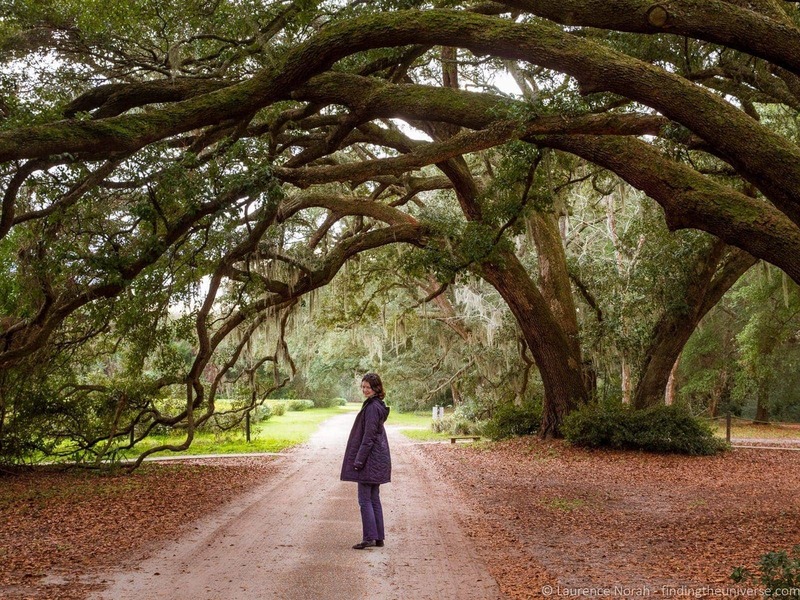 For more on visiting these plantations, see our guide to all the Charleston Plantations. Heading a little bit further out of town, and this might not appeal to everyone, but it’s a fascinating location, and one that is worth visiting. Botany Bay Plantation, about an hours drive outside of Charleston, is a former plantation which is now a park. Buildings survive here from the 1840’s, and there’s a self guided driving tour you can take of the various structures and points of interest inside the park. My favorite part though is the beach. 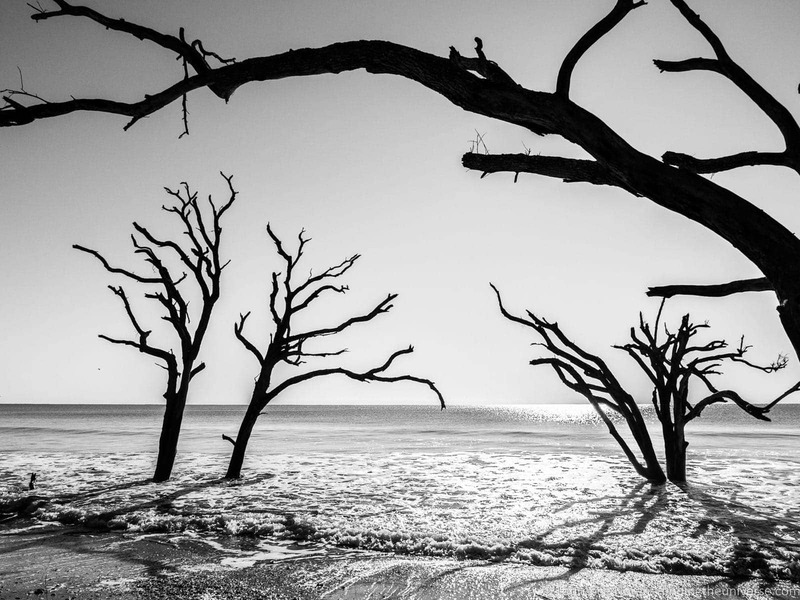 Here, hundreds of trees have been engulfed by the rising waters, creating frozen driftwood sculptures that are beautiful and otherworldly to behold. The drive in to the plantation, featuring moss covered oaks, is also stunning. I had no idea that tea was grown in the US, something I learned when we took a tour of the Charleston Tea Plantation – the only place in the US where tea is actually grown. You can take a tour of the factory to see how tea is grown, hop on a trolley for a tour of the plantation itself, and spend time drinking unlimited amounts of delicious tea, both hot and cold, in the gift shop. There’s a fee for the tour, but it’s also included on the Charleston Tour Pass. 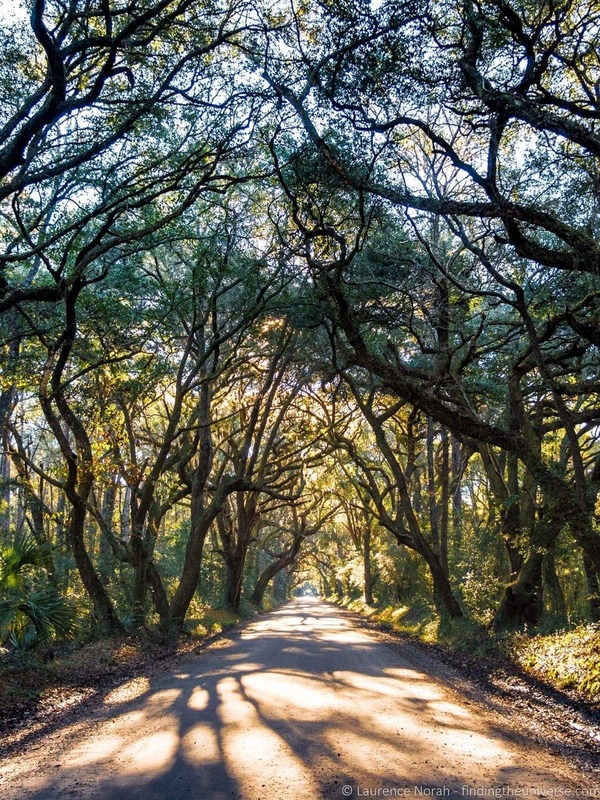 Whilst you’re out here, do be sure to stop off at the stunning Angel Oak, one of the oldest Live Oak trees in the US! It seems like I’ve covered a lot, but I’ve barely got started with what Charleston has to offer – it’s no real surprise that the town has won the award for best small town in the US five years in a row! 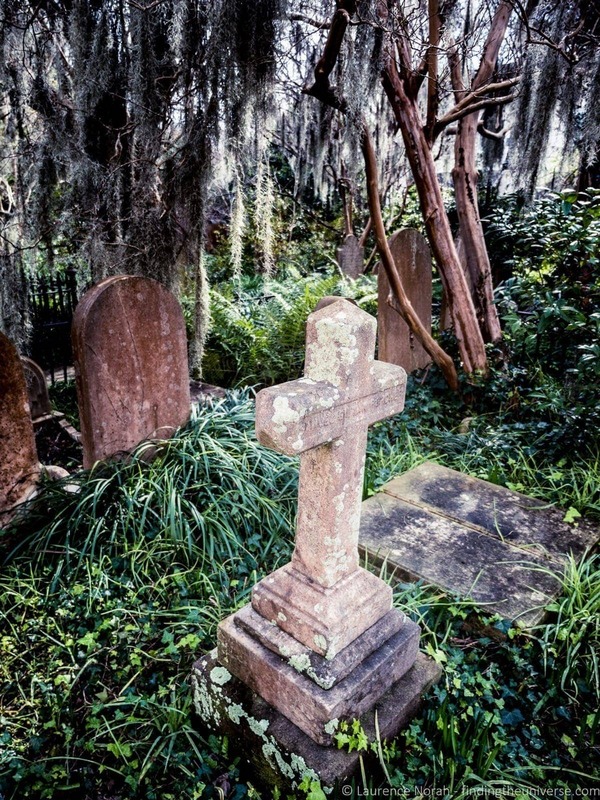 From improv comedy at Theatre 99, to moss covered graveyards, to the City Market, to the park at battery point, to the many gorgeous dwellings that fill the tree-lined streets – there’s huge amounts to do and see here, certainly more than we could manage over five days, let alone fit into a 2 day itinerary! I don’t think you’ll have any problems filling your time, instead, you’ll just be working out when you can next return. 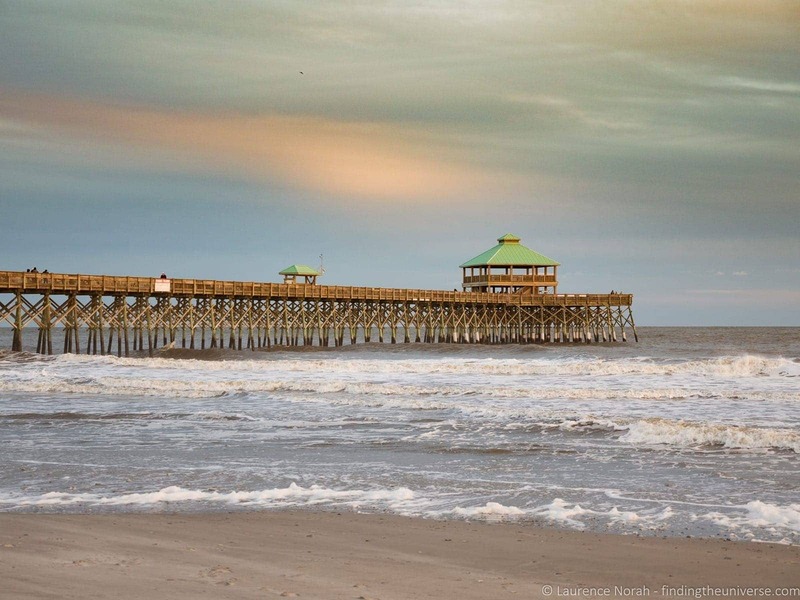 Now lets look at some practicalities for helping you plan your visit to Charleston. Charleston has a well serviced airport offering flights to 19 cities in the US, meaning it’s easy to get here from most places. If you’re coming from outside the US, you’ll have to go via an international hub such as Washington or New York. We recommend Priceline’s flight comparison tool as the fastest way to find the best deals on flights. From the airport we took an Uber, but there are also regular taxis and a shuttle bus service. If you’re looking to get around town and explore further afield, then as previously mentioned, a rental car is a great option. We usually recommend and use Enterprise Car Rental when we’re traveling in the USA, we find they have some of the best prices, particularly on weekly rentals, and a great choice of locations. We also find they’re really competitive for the type of one-way trips that we often do. By car, US Highway 17 runs down the coast through Charleston, whilst I-26 terminates here if you’re coming from the west. Charleston is also serviced by Amtrak or Greyhound. As you can see, plenty of options for getting here! We stayed at a couple of properties in Charleston during our five nights in town, both of which were lovely. We were hosted for three out of our five nights at the gorgeous historic four star Mills House Wyndham Grand. Located slap bang in the heart of Charleston, and within walking distance of the majority of sights and attractions – not to mention being across the road from the finest dining spots in Charleston – we can very much recommend this hotel if you’re looking for something nice. The breakfast was also excellent, and was the first place I got to try grits! We also spent a couple of nights half a mile uptown, closer to the museum and shopping area, in the Francis Marion Hotel. Another historic Charleston property, this one afforded us a lovely view across the city from our 9th floor room. If you are heading to Charleston, and looking for an accommodation deal, here are a couple of the ways we save money when travelling and looking for the best deal. Our favourite way to find the best deals on accommodation is booking.com. They’re easy to use, usually have the best prices, and have everything from hotels to apartments. Check out their Charleston listings here! If you prefer an apartment or more of a hosted stay, then we recommend AirBnB. We’ve tried all the others, and AirBnB consistently has the most options for locations around the world. Plus, if you’ve never used them before, you’ll get up to a $100 discount on your first booking with this link! When we asked for advice on the best places to eat in Charleston, we were universally told that it’s basically impossible to have a bad meal in the city. Competition is fierce, so poor quality venues just don’t survive for long. I can report that we had incredible meals in Charleston, and if you’re a foodie, you might just be arriving into heaven. We also took a food tour with Bulldog Tours, which is an excellent way to get an introduction to some of the specialities of the city. 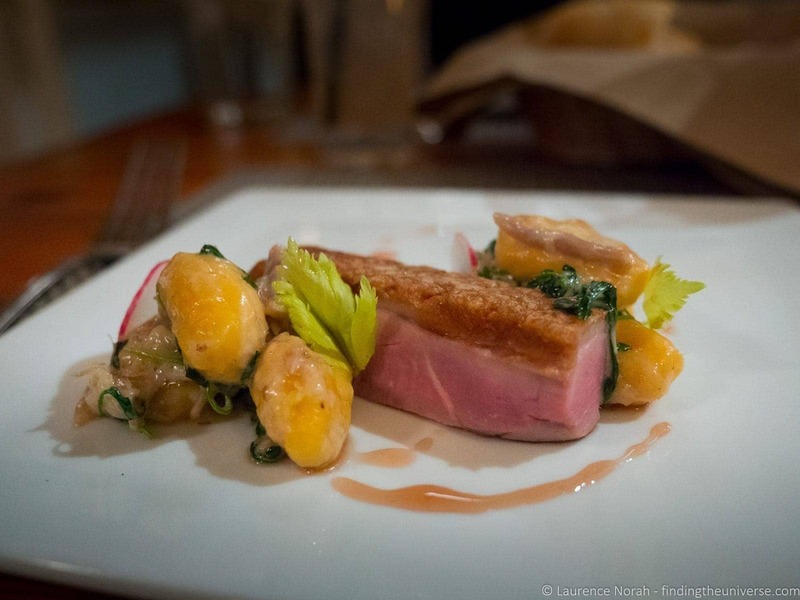 Over our five days in town, four locations stand out as being particularly memorable. The first place was Poogan’s Smokehouse. This is an awesome BBQ joint, and we got messy with a pulled pork sandwich, cornbread, okra, collards – all the classics of the south. 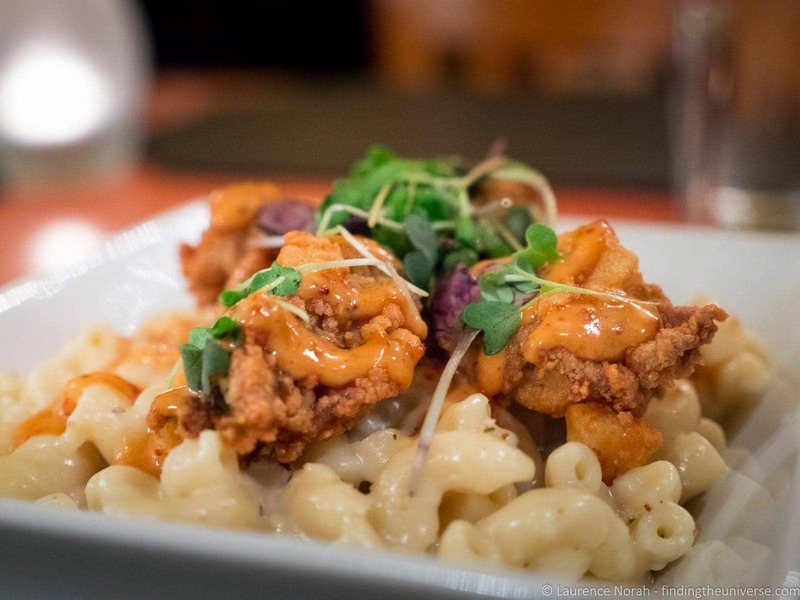 Our next delicious bites were at Jestine’s kitchen, notable for home style southern cooking in a friendly atmosphere. This was where I had my first fried chicken of the trip, and it was excellent! 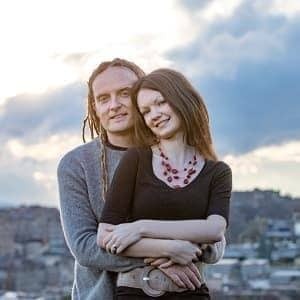 We chatted for a while with the owner who was really friendly, and gave us a run down of all the history of the venue and the lady for whom the place is named. 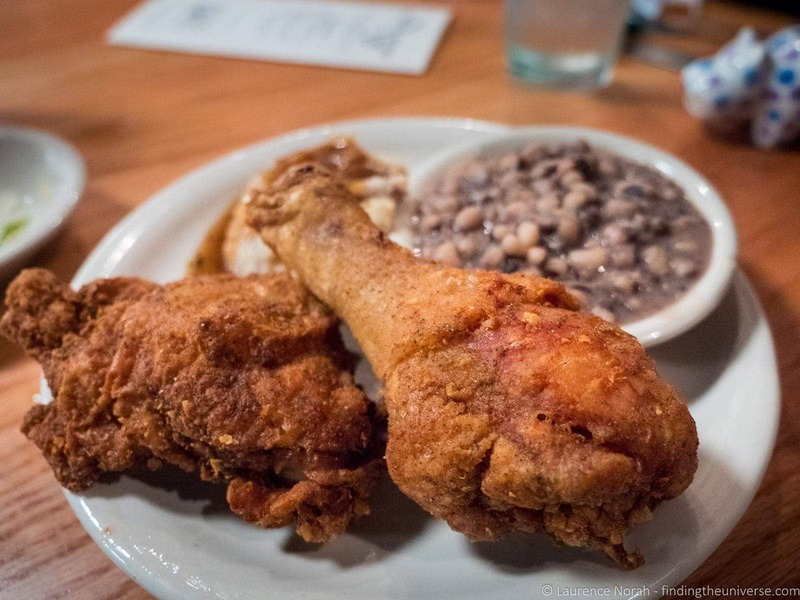 If you’re hankering after some southern comfort food, this is the place to come. The final two locations on my favourites list are two of Charleston’s most iconic restaurants – Poogan’s Porch and 82 Queen. Practically next door to each other, these two restaurants exemplify all that is great about Charleston cuisine. 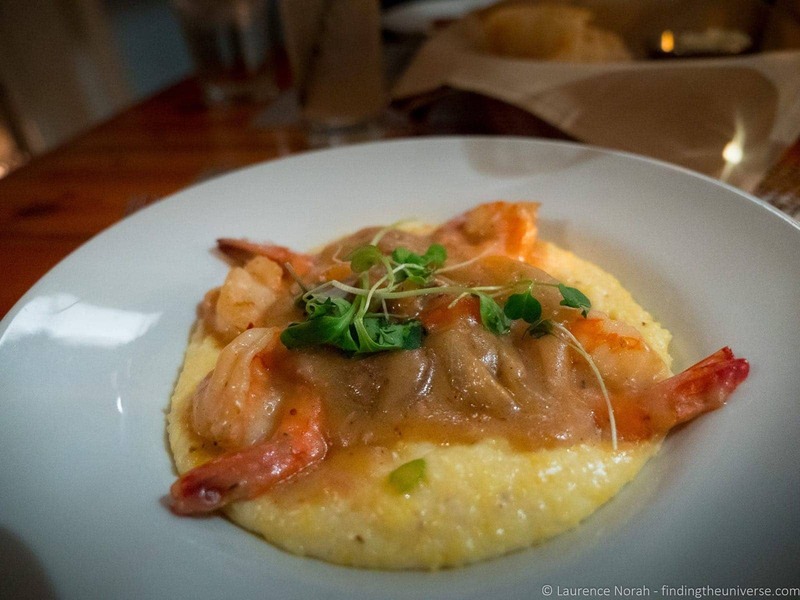 Poogan’s Porch (who also own the smokehouse mentioned previously), are famous for a number of things, but in particular their Shrimp and Grits, which was the people’s choice award in Charleston for this dish. Charleston is notable for a number of dishes, but Shrimp and Grits and She Crab soup are the two most famous, with every restaurant making their own special variant. We had the Shrimp and Grits, and it was delicious. We also had a whole range of other delicious dishes, including the duck below, and I can’t see you being unhappy with anything you have here! And last, but not least, 82 Queen. With Poogan’s Porch being known for the Shrimp and Grits, 82 Queen is where you go for She Crab soup. This is a very rich, creamy soup, which has a little bit of crab roe added (hence the name). I found it excellent to eat, and impossible to photograph. So instead, here’s a picture of some fried oysters, another signature 82 Queen dish. And finally, let’s talk about drinking. 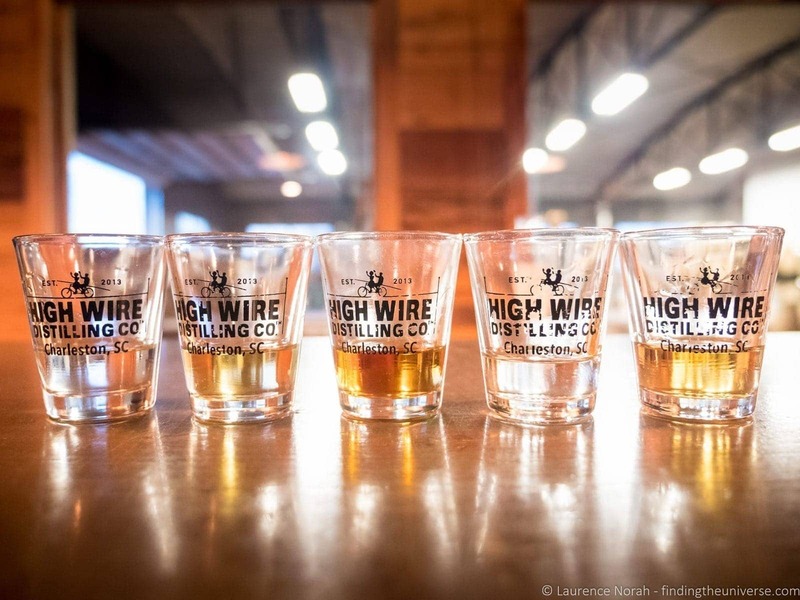 Whilst we drank in fine style at all the above locations (in particular the IPA’s at Poogan’s Smokehouse), one notable venue where we enjoyed something a little bit stronger was the High Wire distillery. For a mere $5, you can do a tasting of some of their more popular drinks, including bourbon, rum, vodka, and gin, as well as take a short tour of the factory itself. This is a lot of fun, and well worth doing. Naturally, they also sell their products on site for you to buy. If you want some more food suggestions for Charleston, check out this awesome post on places to eat in Charleston from my friend Ayngelina. 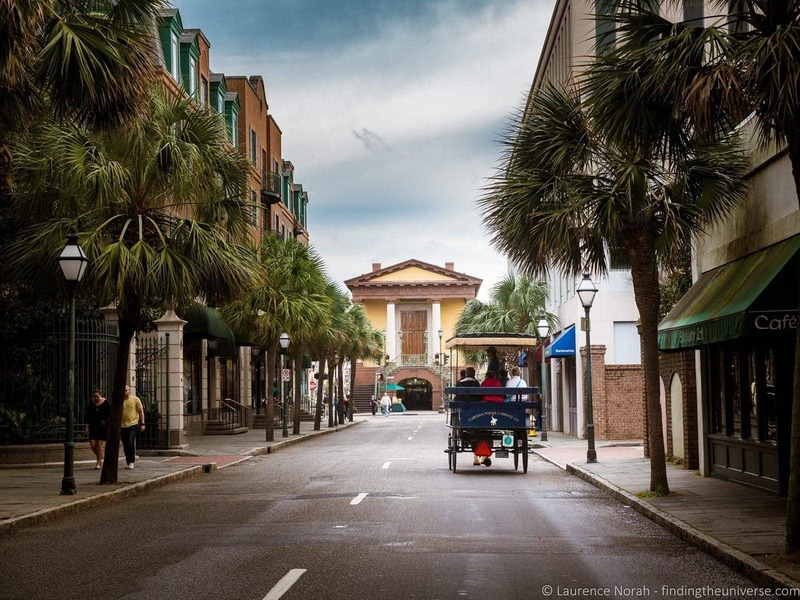 The majority of downtown Charleston is easily walkable, but there is also a free trolley service that runs to the majority of the tourist hotspots if your feet get tired. Check out the route and timetables for that, here. To get to Patriots Point you can take a water taxi, if you don’t have a car. For all the sights out of town, you’re going to be best off hiring a car. We hired a car to cover our last couple of nights in town, which let us visit all the plantations and out of town sights like Botany Bay and Folly Beach, before starting our road trip of the South. 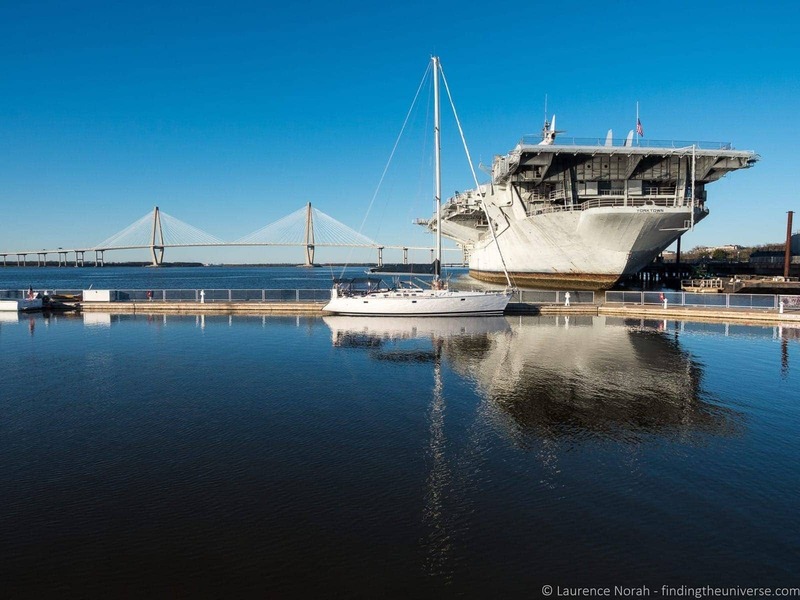 You can also book local bus tours that visit the plantations, Patriots Point, and other locations outside Charleston. We usually recommend and use AutoEurope’s car rental price comparison tool, which despite the name, works worldwide to find the best price on a rental car – it checks all the major car hire companies and we find it usually comes up with the best deal. 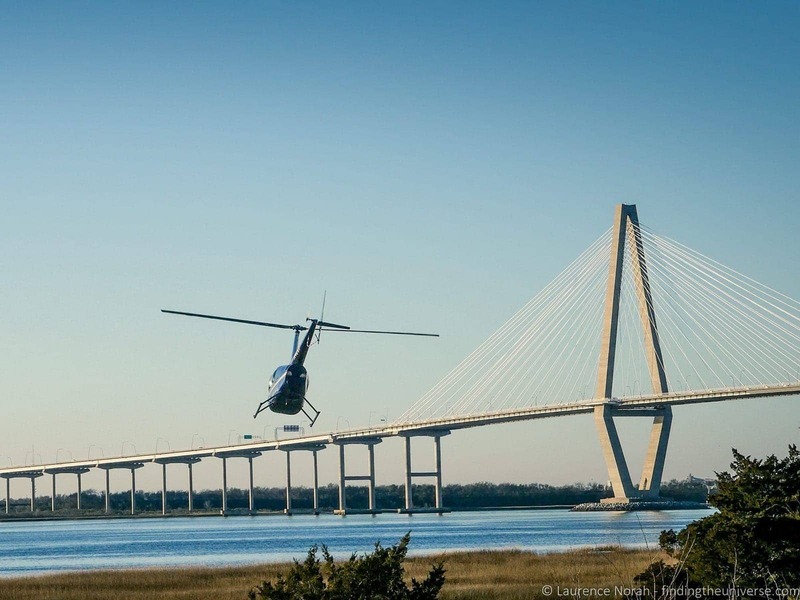 A good for saving money when sightseeing in Charleston is the Charleston Tour Pass. This comes as a mobile pass which works on all mobile phones, and gives you access to over 30 attractions in Charleston, including many of the attractions on our list. We’ve also written guides to things to do in a number of other cities across the USA, including things to do in San Antonio, things to do in Austin, things to do in Albuquerque, things to do in Cambria, things to do in Santa Fe and things to do in Santa Cruz, to name but a few. See our complete USA content here. And that sums up some of our favourite activities in Charleston! As you can see – absolutely loads of ways to keep yourself entertained for a short break (or longer! ), with everything from excellent food through to history, culture and sights. 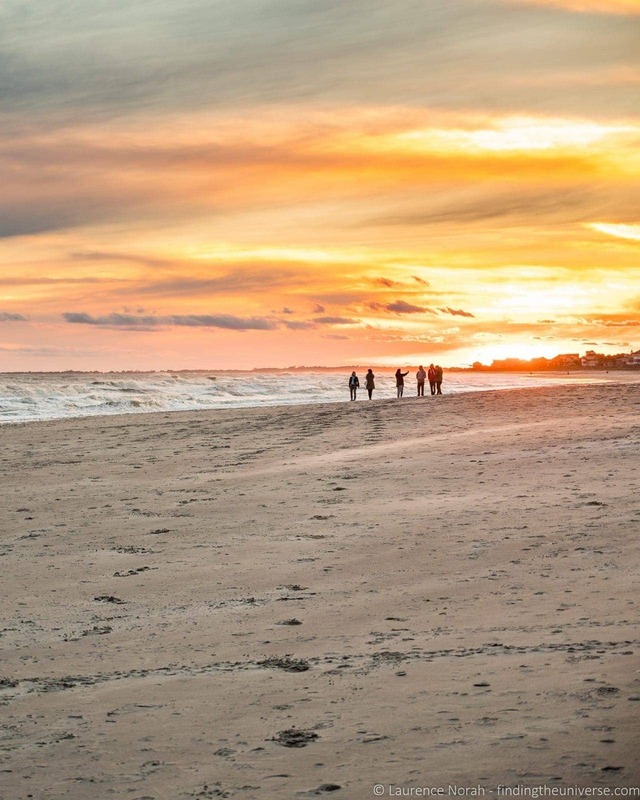 What would you choose to do on your trip to Charleston? Let us know in the comments below! We’d like to thank the Mills House Wyndham Grand Hotel for our accommodation, Charleston CVB for arranging entry to all the attractions we visited and 82 Queen and Poogan’s Porch for feeding us. All other expenses were covered by us. Find out more about who we choose to work with on our code of ethics page. Wonderful info on a city I’ve been meaning to visit. 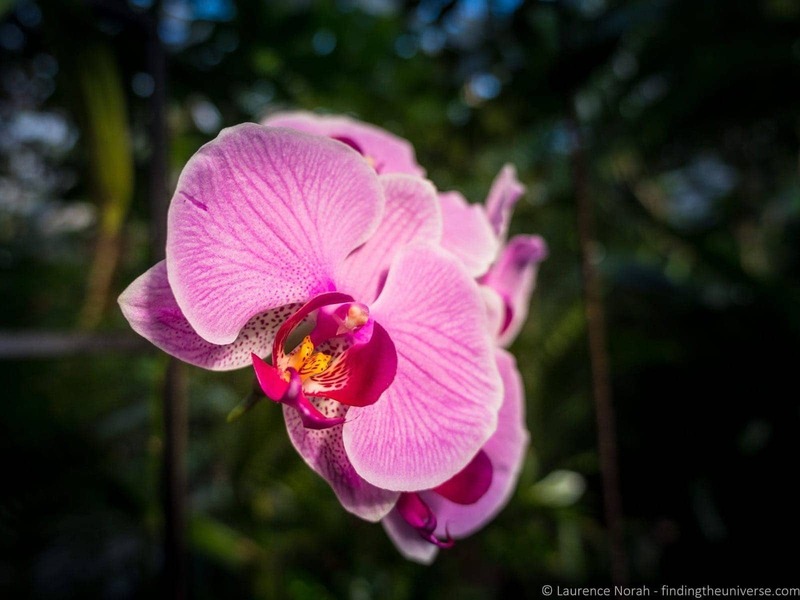 Planning a visit in April and your recommendations are a great help. Thanks Lisa – have a great trip! One of my favorite cities. My parents live on Edisto and every time I go down to visit with them, we take a trip up to Charleston. I recently decided to try my hand at photography. Can’t wait to take my camera on the next trip. 82 Queen is my favorite restaurant in Charleston! I live in SC and I’ve been to Charleston a million times, but I haven’t done some of these things so maybe I’ll give them a try. Looks lovely! I’ve always wanted to visit. I can’t believe there’s a tea plantation! That sounds great.